Infectious diseases remain a leading cause of child morbidity and mortality worldwide. Now in its fourth edition, Manual of Childhood Infections is a simple-to-use, evidence-based, and practical handbook on how to recognize, investigate, and manage both common and rare infectious diseases in children and babies. 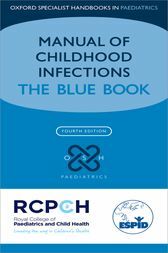 Endorsed by the Royal College of Paediatrics and Child Health and the European Society for Paediatric Infectious Diseases, this fully updatedversion of the established 'Blue Book' complements the Pan European initiatives and UK diploma courses to harmonise patient management and training in Paediatric Infectious Diseases (PID), making it essential reading for UK and European paediatricians.Manual of Childhood Infections is divided into two alphabetized sections for easy access to information, covering key diagnosis and management features of infections alongside crucial points of epidemiology and clinical features. This fourth edition forms practical reading for practising paediatricians, featuring updates to all key chapters based on a literature review alongside new chapters focusing on emerging problems for Europe. I was very impressed by this book, the content is superb, and it is well written and is ideal for a number of health care professionals. Mike Sharland is a Consultant at the Paediatric Infectious Diseases Unit at St George's Hospital, London He is a recognized expert in optimising antimicrobial use in children. He is a board member of ESPID, Chair of ESPID Research Committee, Previous Chair of ESPID Training Committee, and Chair of RCPCH Standing Committee on Infection and Immunisation and Chair of the UK Medicines for Children Research Network Allergy, Infection and Immunity Clinical Study Group. Heis also the Joint Chair of the Pediatric European Network for Trials in Infection.